Romeoville, Illinois, some 30 miles southwest of Chicago, was first called Romeo when nearby Joliet was still called “Juliet.” At this time, the settlement was a twin and rival community of Juliet, unlike the romantic pair of Shakespeare’s era. Founded in the 1830s, the area was home to abundant farmlands and stone quarries. A post office was established on October 29, 1833. In 1845, the city of Juliet’s name was changed to Joliet to honor the famous explorer Louis Jolliet. When this happened, Romeo acknowledged the busted romance by becoming “Romeoville.” Located on the west bank of the Des Plaines River, Romeoville supplied Chicago with produce sent to the city along the historic Illinois & Michigan Canal System, which was opened to commercial traffic in 1848. 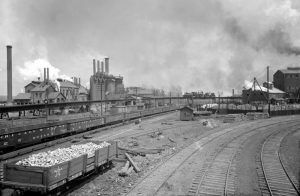 However, it’s main economic source were the numerous limestone quarries in the area, soon gaining it the nickname “Stone City.” In its heyday, two trainloads of limestone were shipped from Romeoville every morning on the Chicago Rock Island and Pacific Railroad. One of the most famous buildings constructed with Romeoville limestone was the Illinois State Capitol Building in Springfield. During the early 1900s, Romeoville thrived as a resort town for wealthy Chicago area residents who flocked to Isle La Cache and Romeo Beach. At that time a streetcar line ran from Chicago bringing along the folks who supported Romeoville’s three taverns. Prohibition and the Great Depression also helped to shape the character of Romeoville when saloons along the canal became numerous. 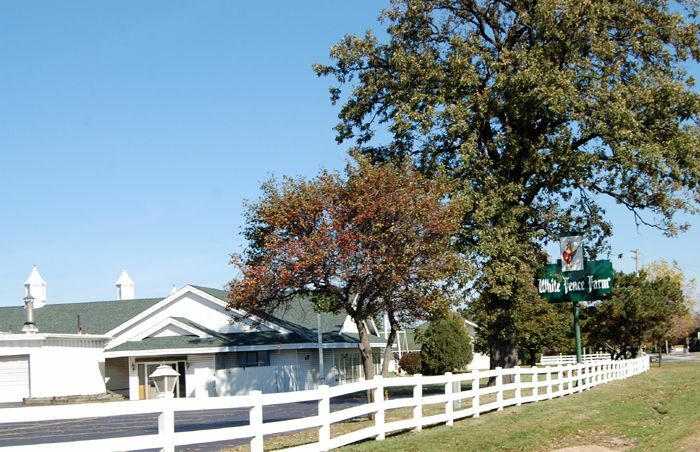 White Fence Farm at Romeoville, Illinois by Kathy Weiser-Alexander. The coming of concrete as a building material spelled the decline of quarrying and Romeoville’s importance was greatly diminished. Lacking new industries, the town’s population gradually declined during the first half of the 20th century. However, in the late 1950s, Romeoville annexed several parcels of land, on which, were built new subdivisions. The new homes soon filled up and Romeoville began to grow again, the population increasing from 197 in 1957 to more than 3500 by 1960. Today, Romeoville is called home to about 40,000 residents with several distribution centers, national companies, and corporate offices. Continue your journey through Romeoville to nearby Joliet which provides a number of historical buildings and vintage Route 66 icons. Joliet, Illinois by the Haines Photo Co, 1914. Joliet originally bore the name “Juliet” which was probably a corruption of the of French Canadian explorer Louis Jolliet’s name. Jolliet first explored this area in the fall of 1673, describing the game as abundant and the prairies wide, surrounded by lush forests. Though the settlement already existed, the official town wasn’t laid out until 1834. 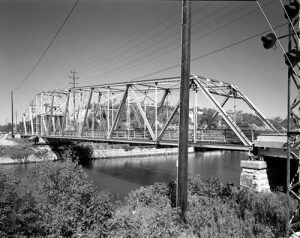 Attracted to the Des Plaines River and the fertile soil of the area, early settlers found ample reason to stay and the town began to grow. Work on the famous National Hotel began in 1837, which soon became an important social center for the town, hosting many balls and social gatherings for the burgeoning city. By 1838, Joliet boasted a courthouse with a jail in the basement sunk into solid rock. At times the courthouse also served as a church. A new and better courthouse was built in 1848. The opening of the Illinois & Michigan Canal in the same year welcomed Joliet into an era of aggressive growth in both industry and residential development. Unfortunately, this building burned down in 1958. Jacob Henry Mansion, Joliet, Illinois by David Wilson, Flickr. 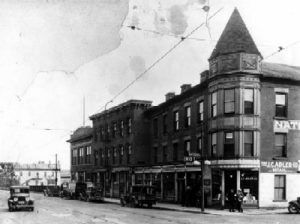 In 1873, the Joliet Opera House was built on the northwest corner of Chicago and Clinton Streets at a cost of $60,000. Opening on February 2, 1874, the establishment hosted a variety of functions from burlesque shows to religious revivals. In the summer of 1890, plans were unveiled for a $15,000 expansion project; however, the Opera House was destroyed by fire on March 1891. Wasting no time, the Opera House was rebuilt the next year on the same location and continued to serve the community for many years. In 1876 a railroad tycoon by the name of Jacob A. Henry built a 16,800 square foot mansion from limestone from his own quarry. 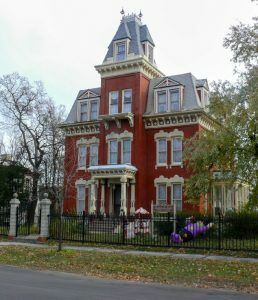 The 40-room home was lavishly finished with walnut and oak fixtures on the inside including solid walnut staircase with 119 hand-carved octagonal spindles. The home, which is a museum today, is said to be the largest and best example of Renaissance Revival architecture still in existence in Illinois. Iron & Steel Works, Joliet, Illinois by Detroit Publishing, about 1900. In the late 1800s, the abundance of soft coal in the area made Joliet a perfect location for the emerging steel industry and soon Joliet was established as a steel town, the success of which brought with it a flood of new residents. The Joliet Steel Works eventually became unprofitable and all operations were ceased by the early 1980s. Today the ruins of the old iron and steel works are preserved as a state historic site. A 1.5-mile trail near the old Illinois and Michigan Canal provides visitors interpretive signs views of the remains of the Joliet Iron Works. Joliet’s Union Station, built in 1912 once catered to the glamorous rail travelers of the early 1900s. Complete with a Grand Ballroom, crystal chandeliers, and 45-foot ceilings, the union station is now listed on the National Register of Historic Places. 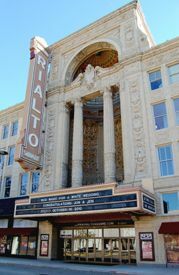 On May 24, 1926, the Rialto Theater opened, unveiling a stunning reflection of Greek, Roman and Byzantine architecture. Theatre-goers that night paid 50 cents to see the silent movie “Mademoiselle Modiste.” Serving the public for years, the theater underwent a complete restoration in 1980 and continues to offer a wide selection of performances today. The Rialto Theatre in Joliet. By Kathy Weiser-Alexander. The Louis Joliet Hotel, built in 1927 was the finest hotel in Joliet for its legendary elegance and luxury. The eight-story hotel featured 225 rooms above a two-story central lobby and lounge complete with a large fireplace with a hand-carved mantel of Bedford stone. The hotel operated until 1964, and the building was designated a national landmark in 1989. It has recently been converted into 56 apartments linked to the revitalization of Joliet’s City Center. On December 26, 1956, Peter and Helen Cinquegrani opened the first McDonald’s Restaurant in the Joliet area on west Jefferson Street. Enjoying tremendous success the flickering red and white neon arches drew many a Route 66 traveler in for a 15 cent hamburger or French Fries for just ten cents. Once an industrial city, Joliet and its population of just over 100,000, has reinvented itself today as a tourist destination providing numerous historic sites and entertainment activities. While traveling through Joliet be sure to look for the many larger than life murals located all over town, visit the Rialto Theater, and cross the Ruby Street Bridge on old Route 66. The Joliet Historical Museum at 204 N. Ottawa Street includes a Route 66 Welcome Center. ©Kathy Weiser, Legends of America, updated March 2019. 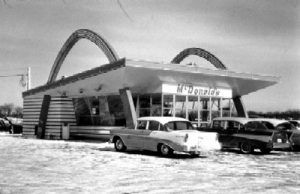 This vintage McDonald’s opened in 1956 in Joliet, photo courtesy Joliet History. 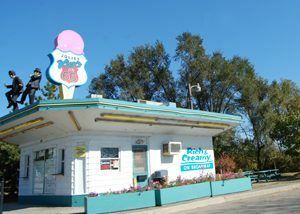 The Rich & Creamy Drive-In in Joliet, Kathy Weiser-Alexander.